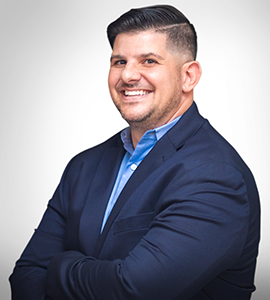 Nick Guadagnino is an owner and the President of Specialized Property Management (formerly Presidential Group South). He has twelve years of experience in the property management industry. Mr. Guadagnino oversees the day to day operations of the company and providing an exceptional customer service experience to the company’s clients. His responsibilities include meeting new clients, employee oversight, and ensuring owner success. Prior to joining the company, Nick worked for Footlocker, managing one of the largest stores in the company, in New York. Nick received his bachelor’s in marketing from Florida State University. He has been a licensed real estate agent in Florida since 2006 and has been a Broker since 2013. In his spare time, he enjoys watching sports, participating in the Big Brothers and Sisters program, and spending time with his wife Nancy.